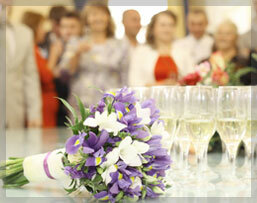 Ember Banquets provides an impressive setting for various corporate events. Our staff helps to oversee every detail of your corporate event - from menu selection to decor and audio/visual needs. With a wide range of flexible, meeting space, Ember Banquets accommodates varying group sizes and set-ups. Customized meetings, team building events, high level executive meetings, corporate dinners, business luncheons, gala cocktail and dinner receptions, company holiday parties, association meetings etc.